Isn't this a fabulous photo? 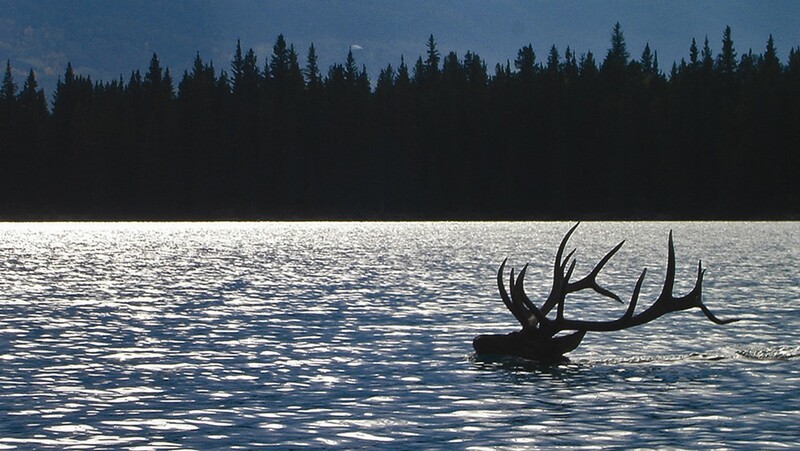 It's an elk, swimming across Lake Beauvert at Jasper Park Lodge, yet another of the lovely Fairmont hotels we stayed at in Canada. Sadly, it's not my photo - I would love to have seen this, and would be immensely proud of the picture as well - and I can't even give a credit as it's out of the anonymous media image library that I've been ploughing through today looking at worthy but much less striking pictures of beds and bathrooms and bars. How magical to see such a sight, on a clear moonlit night with the water silvery and no doubt Mt Edith Cavell across the lake silhouetted sharp and clear! We did see elk, but they were rather boringly just grazing around the grounds or lying down dozing (fortunately the one we encountered out on our bike ride was just as boring, despite the warning signs around, though we prudently made a wide detour just in case). We heard some people talking about having seen one in the water when they were out canoeing, which must have been a thrill - well, it would have been for me, anyway. Having peripatetic elk doesn't fit well with flower gardens, by the way, which means that most of the lodge's colour is restricted to high hanging baskets, all 750 of them; apart from snapdragons, that is. Elk turn up their noses at snapdragons. Perhaps its a species thing. The concierge told us as he was driving us to the railway station that he'd been charged four times by elk and twice by bears while out mountain-biking, and always carries an aerosol of mace. The problem is that, like bears, they get habituated to people and don't always keep their distance any more, and so both cause trouble and make it for themselves. In fact, the females use people, by deliberately choosing to give birth to their calves - 'lay' them, as the term seems to be - close to houses because the babies are safer there from predators. I love all this stuff, it adds an extra layer of interest to life when these things can happen. How dull, that the only thing that'll give you a buzz around here is seeing two tuis on the nectar feeder at the same time. Yawn. *Anyone get the tenuous reference?